Visit Dairy Queen to celebrate Free Cone Day on Wednesday, March 20, 2019, all day long. 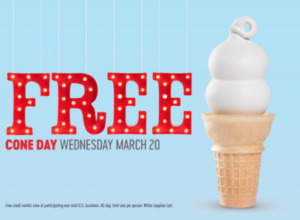 Go to any participating DQ non-mall U.S. location this Wednesday, March 20th to get 1 free small vanilla cone. Free small vanilla cone at participating non-mall U.S. locations. All day, limit 1 per person. You can also download the myDQ App to get another free treat.